I can't believe that it's been 25 years since the movie Willow was released. This is definitely a movie I remember watching countless times as a young kid and absolutely loved it. When I popped in the blu-ray to watch it again and now as an adult, it brought back lots of memories. This is such a one of a kind classic that I'm glad that it hasn't been touched as far as a remake. (Knock on wood) Some movies just need to stay classics and be enjoyed by every generations. I almost forgot how good Val Kilmer looked when he was younger, very handsome! This is such a great movie to watch again and I and I loved the bonus clips and how well the movie looked on blu-ray, the picture was great! Disclosure: All opinions are my own. 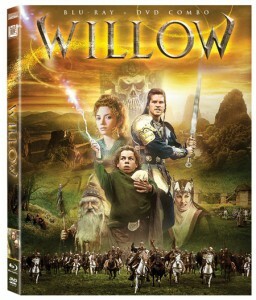 I received Willow at no cost for the purpose of this review. No other compensation was received.